Sample shown on White Stock with Hunter ink and optional Hunter Glossy lining. $69.95 As Low As $0.86 ea. 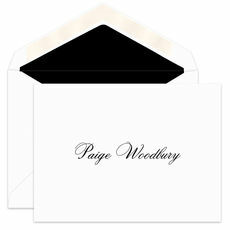 Set of 50 foldover note cards in your choice of stock color with matching blank envelopes. Size is 4.875" x 3.5". Your choice of raised ink colors. Printed return address printed with flat ink available. Typestyle and positioning only as shown.